Rev is a platform that provide document translation services for small and mid-sized businesses around the globe. "An Accurate, Quick-Turn Solution for Translations"
Their transcripts are executed by an actual person...they're not your typical low-quality, inaccurate machine transcripts. As a result, they're able to provide high-quality transcripts at a fraction of the price of other services. It's so easy to work with them as well! All you have to do is upload your audio/video file to the site, it only costs you $1/minute, and within 24 hours you have a transcript back to you. You can't request the same person each time to do your transcripts, which is kind of a bummer. I realize that this would likely be a logistical challenge for them, but I've had some transcriptionists that have been faster/more accurate than others and I'd love to work with them directly if I could! Give them a try! You won't regret it and you'll pay MUCH less than you will with other companies. "Quick turnaround at great price"
I've worked with many transcription vendors and Rev is our preferred. They're reasonable priced but much higher quality and more reliable than other cheaper vendors I've used. The turn-around time is fast, the process of submitting audio and receiving transcripts is smooth, and the quality of the transcripts is strong. There isn't consistency in formatting and time stamping. It would be ideal if there was a more uniform style for the transcripts, at least within a particular project, and if details like time stamps were required on all transcripts. If you are shooting video, record the audio on a small recorder and use that file to send to Rev, as the video files can be too large and problematic to strip audio from. What Transcription solution do you use? Their ease of use and their pricing are probably their biggest upsides. Timestamping is an upcharge, but totally worth it. Their voice recorder app makes it easy to record on your phone and upload while you're working in the field. And they're fair: In one particular interview, they couldn't provide the timestamping and they refunded the charge without being asked. Nothing to dislike, but I would love it if they branched into translation services. The 24-hour turnaround is about as fast as you'll find in the industry. Many times they'll turn something around in 8-10 hours, depending on the file size. But allow a full 24 hours for larger projects. "Easy to Use and Fast Turnaround on Service"
The Rev interface is so simple: you just upload your recording files, wait for them to process, review your order and the cost, and submit your order. It's one of the most affordable services on the market, at $1/minute to transcribe files. Rev allows you to upload standard audio formats, such as MP4 and WMV files. Turnaround on the work is incredibly quick - I have submitted orders that were roughly 6 or 7 hours in total, and received notice the next day that the order was complete. I also like that, if a file is not capable of being transcribed -- for example, in instances where the audio quality is poor -- you are notified and permitted to upload again without any billing penalty. Finally, the transcriptions are very well done. It's very clean and professional looking (we receive ours in Microsoft Word format, although you can request other formats). Also, customer service responds quickly and thoroughly. I don't like receiving piecemeal notifications when a single transcription within an order containing several transcriptions is complete. In our case, it is more convenient to simply be notified at the end of the order that all transcriptions are complete. The first and last pages of the documents include company logos and the like. Our files tend to be webinar recordings and we post both that recording and the transcript online when they become available. It's a nuisance to have to delete the extra branding for every transcript. And finally, as would love to be able to export completed transcripts to PDF format (they are available in Word). Rev is one of the most affordable transcription services on the market, wich is ideal for organizations and businesses on a smaller budget. (Fees for us are one dollar per minut of recording, as of this writing). It is very easy to upload files and submit. The work is often completed quickly., and can be easily downloaded when complete. Have no complaints. Excellent service. The turnaround time for longer files can take a bit longer - something to be aware of when ordering. This really is an excellent service if you need captioning or transcription services. We have ordered both and have had excellent results. Turnaround time is great, and responsiveness is also very good. It's easy to access a record of orders and if necessary download the cation/transcript files again as needed. "Fast translation solution in record time"
Rev is a software that allows you to translate audios in several formats quickly, it is easy to send the files and with an accessible price. This is usually a great advantage for companies that work with people from several countries, being the most complete software on the market. I have no complaints about this software, on the contrary, I have to say that I had never worked with an efficient team such as Rev, sometimes my files were not good enough to be translated and I received the notification to correct it. and send it without additional costs. "Revvin it up with Rev!" It's fairly priced and the turnaround time is incredibly fast. It solves at least two of our needs all on one website. The turnaround time for most of our projects is only a matter of hours! I really haven't encountered anything that I dislike yet. Give it time and I may find something to improve upon. Be patient the first time you use it. It can get confusing. "Easy to use and transcription services are really handy!" I like that it is easy to use without a lot of settings or options. I also like that it allows you to request transcription services within the app and software. I haven't found any significant issues with the software or app - it records well even when multiple people are talking. Use the easy-to-use app on your phone. "Rev is a One of a Kind Company "
The welcoming and team like atmosphere is something that Rev has perfected. The flexibility of this service is what I like best. I can work from anywhere at anytime. You cannot find that hardly anywhere. What I think could be improved on is there marketability. Hardly anyone I know has heard of this service and I think their lack of adverstising contributes to that. For customers, they provide timely communication and care about quality of service more than anything. 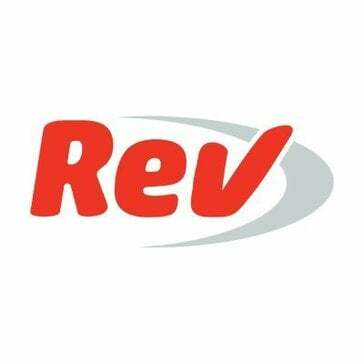 "Top Notch Transcription Service by Rev"
The turnaround time at Rev is very quick. When you submit a poor quality audio, you can expect less than perfect transcription. Transcription requests are easy to submit and Rev offers a fast turnaround. "Excellent service for reliable translations"
Although reasonably quick turn around the translation can take upto 24 h.
"Helpful for Closed Captioning "
It is so convenient to have someone else do the captioning for me! Just be prepared for some mistakes if you don't have high quality audio available. This works best when you have high-quality audio, so keep that in mind when you are submitting a project. Human transcription and translation for projects brings an element of authenticity to a project and helps both my company and our clients to obtain accurate insights. Rev is timely and accurate. There is not always a concrete ETA on deliverables. "Seems like a great platform"
I like that the transcriptions are fairly accurate. The transcribers they use are fairly thorough. I do wish the price was a bit lower, but you get what you pay for and Rev is definitely thorough! I liked that the service was affordable. I cost a little extra if I needed foreign subtitles. Great service and value for captioning, transcribing, and subtitles. It can be hard to use sometimes but overall it’s not really an issue. "REV is right for you"
Transcribing is done quickly and efficiently. Never have any issues. "Excellent service, timely and accurate"
Quick turnaround, reasonably priced. Easy to work with. So far....nothing! They have been spot on. Best transcription service I have worked with. * We monitor all Rev reviews to prevent fraudulent reviews and keep review quality high. We do not post reviews by company employees or direct competitors. Validated reviews require the user to submit a screenshot of the product containing their user ID, in order to verify a user is an actual user of the product. Hi there! Are you looking to implement a solution like Rev?